In November of 1968, Cleveland poet d.a. levy, beleaguered by police and local authorities over his controversial poems and despondent about his life and future prospects, committed suicide at the age of 26. Fifty years on, levy’s legacy as a poet and forerunner of the small press movement is larger than ever. Read Mark Kuhar’s story about levy on Cleveland.com. Permanent link to this topic. Posted 2018-11-14 16:57:39. Reply to Lauren_Felder. 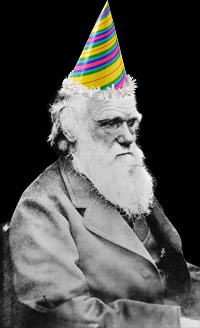 Join us in the Library on Thursday, February 12, 2009 from noon to 1:00 on the first floor to commemorate the 200th anniversary of the birth of evolutionary biologist Charles Darwin (1809-1882) and to recognize the "Year of Darwin." Dean Bette Bonder of the College of Science will initiate the celebration. Darwin Day is a global celebration of the discoveries and life of Charles Darwin, the man who first described biological evolution via natural selection with scientific rigor. Darwin Day also recognizes the enormous benefits that scientific knowledge, acquired through human curiosity and ingenuity, has contributed to the advancement of humanity. Short Film Viewing: "Evolution - Darwin's Dangerous Idea"
Darwin Exhibit: A comprehensive display of photos, books, and objects related to Charles Darwin. Assembled by Dr. Robert Krebs, Department of Biological and Geological and Environmental Sciences in the College of Science. On display through February. Event sponsored by the CSU College of Science and the Library. Free and open to the Campus Community. Call 216-875-9734 for more information. Permanent link to this topic. Posted 2009-02-06 15:31:28. Reply to Barbara_Loomis. Categories: Library News. dataZoa is a web based research tool used to access and store data from many websites to a single location. You can collect data from popular websites including the US Census Bureau, Bureau of Labor Statistics, and Federal Reserve Economic Data, then view data in a standardized format from your account in dataZoa. You can also create tables and charts driven by live data that will automatically update. Create your free dataZoa account using your CSU email address today! 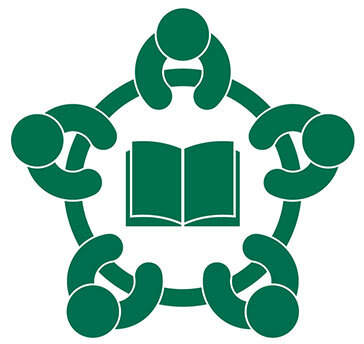 For more information, contact Carol Zsulya at c.zsulya@csuohio.edu. Funding for dataZoa at CSU provided by the Maxine Goodman Levin College of Urban Affairs. Permanent link to this topic. Posted 2015-04-15 09:03:07. Reply to Barbara_Loomis. Categories: Library News. Spectrum: The Lockwood Thompson Dialogues: Pen & Ink series is a collaborative effort between the Cleveland Public Library and Cleveland Public Art. Free and open to the public, this event will be held at the Cleveland Public Library's Louis Stokes Wing on Thursday, December 13th at 7:15pm with a reception in the lobby prior to the conversation at 6:30pm. The Pen & Ink series explores how words and images together have played crucial roles in storytelling and visual communication. Today's artists and writers continue to push publishing in new directions while challenging the perceptions of high and low art, often with irreverence and razor sharp commentary. Permanent link to this topic. Posted 2007-11-27 10:12:37. Reply to Tracy_Kemp. Categories: Library News. Join the Cleveland State University Library, Department of Health Sciences, and the College of Liberal Arts and Social Sciences on Thursday, April 17, 2008 for the Dedication Ceremony of the Adaptive Technology Lab to the Memory of Preston White. The event will be held in Cleveland State University Library Rhodes Tower, Room 103 from noon to 1:30 p.m.
Refreshments will be served following the dedication ceremony. Permanent link to this topic. Posted 2008-04-04 12:07:19. Reply to Barbara_Loomis. Categories: Library News. Have you had problems with students plagiarizing? Are you worried that it could happen? Attend this panel discussion to learn strategies to deter plagiarism, how to spot it, and what happens if a student is caught plagiarizing. The discussion will be held in RT 502 on Thursday March 26 at 12:00 p.m.
-	Valerie Hinton Hannah, Student Judicial Officer. A light lunch will be provided by the Friends of the Library and there will be door prizes. For more information or to reserve a seat call 216-875-9734 or b.florjancic@csuohio.edu. Join us on Thursday, April 23 at noon to learn about all the recent enhancements to the facilities including a brief tour of select areas of the Library. Permanent link to this topic. Posted 2009-03-24 08:54:35. Reply to Tracy_Kemp. Categories: Library News. Digital CSU "Meet and Greet"
The Digital CSU Working Group will host a "Meet and Greet" Tuesday, September 18, 2018 from 11:30 am - 12:20 pm in the the Michael Schwartz Library, RT 502. At this event, we plan to (re)introduce Digital CSU, share information about upcoming events, and provide an activity for attendees to discuss the digital interests/projects. We will also have information pertaining to the Digital Student Showcase that will take place during the fall and spring semesters. Light refreshments will be served. Join us! Digital CSU is a low-stakes environment to learn about digital methods in research & teaching across disciplines and colleges at Cleveland State University. It convenes once a month during the academic year. For more information about Digital CSU, including the monthly meeting schedule, visit http://engagedscholarship.csuohio.edu/digitalcsu/. Permanent link to this topic. Posted 2018-09-18 09:02:28. Reply to Barbara_Loomis. Categories: Library News. Digital CSU is happy to announce the second Digital CSU Student Showcase in partnership with the Michael Schwartz Library! The showcase is a round-table event where students can share their digital work with fellow students, faculty, and staff. The event will take place in the Student Center Atrium on Wednesday, November 28, 2018 from 11:30 am - 12:30 pm. Light refreshments will be provided. Join us! Students who want to participate should register here. Participants must be prepared to share their texts digitally, which requires that each participant brings the necessary equipment (e.g. laptop, headphones, speakers, etc.). Participants are encouraged to provide supplemental materials such as handouts about their design process, research methods, or other relevant documents; however, this is not required. For more information about the Student Showcase, contact Melanie Gagich, First-Year Writing Program at m.gagich@csuohio.edu. Permanent link to this topic. Posted 2018-11-21 10:32:35. Reply to Barbara_Loomis. Categories: Library News. Join the Digital CSU Working Group for a presentation of New Podcasting Resources at CSU on Tuesday, February 5, 2019 from 11:30 am - 12:30 pm in the Michael Schwartz Library, RT 304. The Center for Instructional Technology and Distance Learning (CIT&DL) has recently upgraded its audio studio to a podcasting studio. This new facility allows faculty and staff to create their own video and audio broadcasts that can be shared across countless media platforms. At this Digital CSU event, Chris Rennison, Senior Instructional Technologist, and CIT&DL media production staff will provide an overview of the essentials of podcasting and discuss its various educational possibilities, as well as feature a live podcast in action. Light refreshments will be served. Join us! Permanent link to this topic. Posted 2019-02-01 17:23:23. Reply to Barbara_Loomis. Categories: Library News. The Digital CSU Working Group, in partnership with the Michael Schwartz Library, will host a showcase for digital projects created by CSU students. The showcase will be held on Tuesday, April 23, 2019 from 11:30 am - 12:30 pm in the Berkman Hall Atrium (formerly named Main Classroom) . Light refreshments will be served. Join us! Digital CSU is a low-stakes environment to learn about digital methods in research & teaching across disciplines and colleges at Cleveland State University. It convenes once a month during the academic year. Digital CSU conveners: Melanie Gagich, Chris Rennison, and Emilie Zickel. Permanent link to this topic. Posted 2019-04-22 10:17:25. Reply to Barbara_Loomis. Categories: Library News. Do you use digital methods in your research or teaching? Do you want to learn more about digital tools available or in use on campus? Please join us for the first meeting of the "Digital CSU" working group, a low-stakes environment to discuss all things digital! All CSU community members are welcome and refreshments will be served. Topic: Working Group Introduction and Project Show & Tell. For more information email Dr. Shelley Rose at shelley.rose.csuohio.edu or call 216.687.3935. Permanent link to this topic. Posted 2016-09-15 14:28:38. Reply to Barbara_Loomis. Categories: Library News. Do you use digital methods in your research or teaching? Do you want to learn more about digital tools available or in use on campus? Please join us for our second meeting of the Digital CSU working group, a low-stakes environment to discuss all things digital! All CSU community members are welcome and refreshments will be served. We will meet this month on Thursday, October 27 in RT 502 from 11:30-1:00 pm. Chris Rennison, Senior Instructional Technologist, Center for Instructional Technology and Distance Learning will present Augmented Reality Sandbox. Learn more about Digital CSU. Permanent link to this topic. Posted 2016-10-24 14:22:59. Reply to Lauren_Felder. Categories: Library News. Please join Digital CSU for a Citation Managers 101: RefWorks and Zotero Workshop, by Mandi Goodsett, Performing Arts & Humanities Librarian. The workshop will take place on Thursday, February 23, 2017 in MC 420 from 11:30 am -1:00 pm. Refreshments will be available for all attendees in MC 429 until 1:00 pm. The Digital CSU March meeting will feature Mark Souther, Director, Center for Public History + Digital Humanities and History Professor, who will discuss Oral Histories. Thursday, March 23, 2017 in RT 502, from 11:30 am -1:00 pm. Permanent link to this topic. Posted 2017-02-17 10:30:52. Reply to Barbara_Loomis. Categories: Library News. Please join Digital CSU for an Introduction to TEI (Text Encoding Initiative) Mark-Up Workshop, by Lee Zickel, Humanities and Social Sciences Technologist, Case Western Reserve University. Using a few real-world examples, this informational [workshop] will provide a brief introduction to TEI-XML mark-up and it's value as a scholarly and pedagogical tool. The workshop will take place on Tuesday, November 7, 2017 in the Michael Schwartz Library, Rhodes Tower, room 325 (viewing room) from 11:30 am - 1:00 pm. The workshop is free and open to all CSU faculty, staff, and students. Lunch will be served. Permanent link to this topic. Posted 2017-11-02 11:44:49. Reply to Barbara_Loomis. Categories: Library News. Please join us for our Digital Drop-in. CSU Faculty & Staff will be available to talk one-on-one about their expertise in various digital methods for teaching & research including Cleveland Memory, Zotero, Refworks, EngagedScholarhip@CSU, SelectedWorks, Omeka, Curatescape, Oral History, WordPress, Google apps, and more! Drop in when you can & talk tech with your colleagues! The Drop-in session will take place on Thursday, January 26, 2017 in MC 420, Active Learning Classroom, from 11:30 am -1:00 pm. Refreshments will be available for all attendees in MC 429 from 11:30 am - 1:00 pm. Presenters: We are seeking additional participants with expertise in various digital methods & platforms. Please fill out the form at Digital CSU Working Group website if you are interested in participating as an expert. Permanent link to this topic. Posted 2017-01-23 13:10:26. Reply to Barbara_Loomis. Categories: Library News. 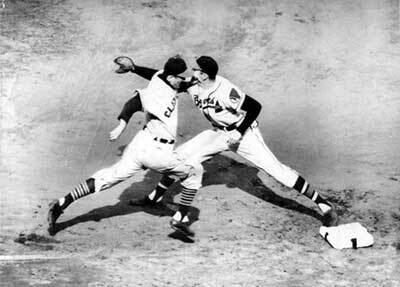 Lou Boudreau of the Cleveland Indians runs to first base in the 2nd World Series Game - 1948. With the results of the games played on September 30, the Cleveland Indians have been mathematically eliminated from playoff contention this season. Despite a strong second half, the Tribe simply ran out of time, and came up a little short. I know it gets old to hear this all the time, but wait until next year! With a core of talented young position players such as Jason Kipnis, Yan Gomes, and Francisco Lindor, and with some of the best starting pitchers in the league in Corey Kluber, Carlos Carrasco, and Cody Anderson, the Indians are poised to make a genuine run at the pennant in 2016. At least that’s the dream! In the meantime, Cleveland Memory can help revisit old glories, such as the 1948 season when the Indians won the World Series. This link will show you Cleveland Press photos from that championship season. You can order hi-res digital copies or 8 x 10" prints of these photos, and of nearly any other photo you come across on Cleveland Memory. For more information, click here. Permanent link to this topic. Posted 2015-10-02 07:39:19. Reply to Lauren_Felder. Categories: Cleveland Memory, Library News. The Library invites faculty and staff to submit their published books for display in the Library. Currently, over 130 books written by Cleveland State University's faculty and staff are showcased in four secure oak display cases on the Library's first floor. The display includes scholarly works from every discipline and includes such authors as David Forte, Professor, Cleveland Marshall College of Law; Ralph Mawdsley, Professor, CASAL; Murali Nair, Professor and BSW Coordinator, Social Work; Bette Bonder, Dean, College of Science; Gregory Sadlek, Dean, Liberal Arts & Social Sciences, William Bowen, Director, Ph.D. Program and Professor, Urban Studies; and Michael Schwartz, President. Call 216-875-9734 today for information on how to add your book to the display. Permanent link to this topic. Posted 2008-01-10 09:07:27. Reply to Barbara_Loomis. Categories: Library News. Permanent link to this topic. Posted 2013-01-02 08:47:39. Reply to Lauren_Felder. Permanent link to this topic. Posted 2012-12-14 07:19:18. Reply to Lauren_Felder. Categories: Library News. Dissertation Boot Camp offers access to services and quiet space for CSU Ph.D. and doctoral students. The Writing Center, Michael Schwartz Library, and the Graduate Student Resource Center have teamed up to offer you one solid week of time dedicated to completing your dissertation and addressing any needs you have related to completion. Lots of dedicated and unstructured time to write in a quiet environment. A chance to gain access to one of 5 free library carrels during boot camp week. One-on-one consultation and short workshops by writing tutors and librarians from the CSU Writing Center and The Michael Schwartz Library. A specialist available to assist with your questions about formatting and OhioLink submissions. CSU Counseling Center staff leading sessions on motivation. Campus Recreation staff leading physical activity breaks. Morning and evening sessions are offered to meet the needs of students who work. Register now at the Dissertation Boot Camp website. Permanent link to this topic. Posted 2015-03-06 15:38:37. Reply to Jeff_Beuck. Categories: Library News. 3 producers of the film will be at the second showing for a question and answer session. Cleveland State University faculty, staff, and students and the general public are invited to attend a free screening of Holodomor: Ukraine's Genocide of 1932-1933 (80-minute documentary feature film by Bobby Liegh). 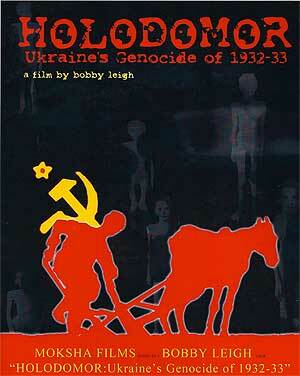 Holodomor claimed more lives than were lost on every battlefield combined during World War I. 7-10 million people, including 3 million children, perished in 17 months. This film aims to tell their story. In 1932-33, Ukraine, the breadbasket of the Soviet Union and Europe, had bountiful crops of grain, yet its people were dying of starvation. In order to crush the will of the independent-minded Ukrainian peasants and secure collectivization of all Ukrainian lands, Joseph Stalin ordered an army of ruthless, well-fed Communist Party activists to confiscate all harvested grain and seize all the foodstuffs in the villages. As a result of this genocidal decree, by the end of 1933 nearly 25 percent of the Ukrainian population - up to 10 million people, including three million children - had perished. In the face of terror, Ukrainians had little possibility of escaping their horrific fate to create another life elsewhere. Travel was banned for Ukrainians keeping them confined in a prison of starvation within their own villages. To this day, the Russian government still denies this genocide ever occurred, perpetuating "the biggest lie, best kept secret." Cosponsored by the United Ukrainian Organizations of Ohio and the Cleveland State University Michael Schwartz Library. Permanent link to this topic. Posted 2010-03-04 13:36:42. Reply to Barbara_Loomis. Categories: Library News. Please join us on June 9 at 2:00 in RT 502 for a talk titled Documenting the Past: The BIPA Project presented by Dr. Ralph DiFranco, Recipient of Cleveland State University's Distinguished Alumni Award 2006. Permanent link to this topic. Posted 2006-05-22 15:24:50. Reply to Lauren_Felder. Categories: Library News. Showing posts beginning with D only. See display options.